Dear Edge, sometimes, we are so involved with hard problems, as I am, but always I´ll have you as my inspiration to follow what I'm looking for....it's called all because of you.....again. Happy birthday, full of health, peace, love and success, with your family and friends. I wish your dreams come true. You don't need worry about that "insecurity is your best security". Be sure, we are, all, interested in you, in U2. U2's stuff are relevant for us. Where U2 goes, we follow U2, we come together. Happy Birthday Bono. Great party for you and your family and friends. Your new album will be ok when it's will be ok.... by Regina O'Numb - Sao Paulo - Brazil. Dear Adam Clayton I wish your dreams come true. I wish all the abundance in your health, your business, your music; with your family. Thank you so much for your appearances, this time. I hope the new album in a good way....I hope, too, see you soon, during a tour in Sao Paulo-Brazil. God Bless you. You Adam, you "found" Paul McGuinness, U2's great manager, you booked the first gigs, since the start you are totally committed to being in U2. You´re a rock'n'roller. We couldn't be so thankful and proud to have you in our favorite band, the great bassist of the two centuries. God Bless you and yours. Merry, merry Christmas, and a Happy 2014. I hope see you soon. by Regina O'Numb - São Paulo - Brazil. Happy Christmas, Lord of my castle. A great 2014 with live performances. Shine on this Christmas time. A lot of peace and love this Chtistmas time. Fun 4 efer! Happy Xmas! Happy 2014! I play guitar, I love U2. Happy Christmas. 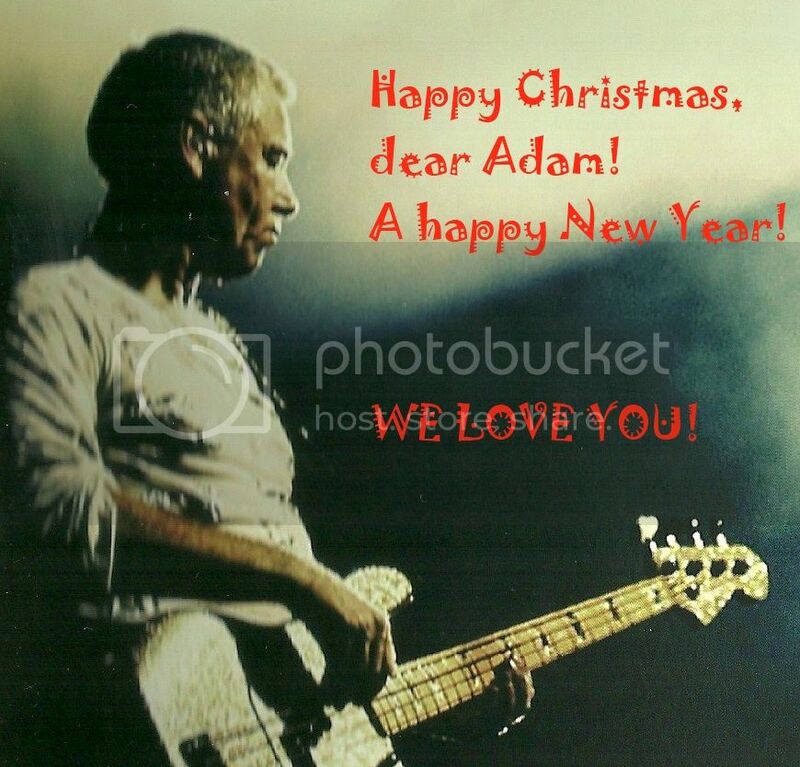 Lord Adam Clayton, Happy Christmas and Happy New Year. Never I won't forget february 20, 2006. Happy Christmas; Happy New Year! Happy Christmas, Happy New Year. Merry Merry Christmas and a beautiful New Year! I love you! Happy Christmas time! Happy Christmas, poet of my castle. A great 2014 with live performances. A true great musician deserves a great Christmas time. most beautiful man, happy christmas! happy new year! MERRY MERRY CHRISTMAS AND A HAPPY NEW YEAR! God Bless you and yours in this Christmas time. Thanks for your work as a singer, leader band, composer, charity man....God Bless you. Happy Christmas and a Happy New Year. You deserve the best Xmas time! ...Happy Christmas and Happy New Year. Beautiful boy Larry, these are your words: "I was the guy who borrowed the guitar for the first rehearsal. I borrowed the guitar for the first gig as well. I was in charge, I was the leader of this band for two days. Two days was all I lasted." You know, you´re the owner of the band and you planted the seeds of U2 with that note posted at school's notice board in searching of musicians.....Well, we are completely and forever full of thanks. God Bless you and yours. Merry, merry Christmas and a Happy New Year. I hope see you soon, playing live. by Regina O'Numb - Sao Paulo - Brazil. Happy Christmas, Beautiful Boy of my castle. A great 2014 with live performances. Happy Christmas * Happy New Year! thank you so much to take care U2 as you do. Happy Christmas time. Happy Xmas, Happy New Year! Happy Xmas, Happy New Year. Happy Christmas and a Great New Year. Happy Christmas, Gorgeous man of my castle. A great 2014 with live performances. From Japan: Happy Xmas, Happy 2014. A Christmas full of love. A New Year full of success. In the human heart, there is no limit....Happy Christmas and a Happy New Year. Best wishes. Happy Christmas and Happy New Year! When I see you playing, it seems you are so young as myself. Happy Xmas! Happy New Year! Your sound moves me. Happy Christmas Edge. Happy New Year Edge. Happy Christmas. Happy New Year! You´re the best. God Bless you and yours! Happy Christmas time. HAPPY BIRTHDAY LARRY! Really, you and your "nice" country, had a journey side by side. You had time to grow at your own pace, protected and away from the "circus" of the rock'n'rolll culture. You weren't involved in that. You could be yourselves, be with your families, and do all the things human beings are meant to do. Your music comes from being around real people in the real world. This is fantastic for us, your fans, all around the world. Thanks, of course, for placed a notice at the infamous Mount Temple Comprehensive School in the fall of 1976, and on September 25, 1976, the band auditions began in your kitchen in Artane. I wish your dreams come true. God Bless you and yours. I hope see you soon. by Regina O'Numb - São Paulo - Brazil. Happy birthday Larry! I’m still thankful you put up that famous note on the schoolboard in Mount Temple in 1976, seeking musicians for a band. Thirty seven years later U2 is still making music with you as a stronghold behind the drums. I was happy to meet you outside the Hanover Quay studios in 2001 and appreciate your no nonsense attitude. Greetings from Belgium. Happy birthday Larry!!! May this be a beautiful day for you and your family. Thank you for anything you have done in these years. Thank you for putting "that" message at school: it was a good idea! The world as we know needs a time to reconsider some old prejudice about human life. Your song, your chords, were perfectly associted with human feelings. Well, they were, they are and they will be associated, cause your songs, always, had, have and will have a vibe in tune with the best feelings, with respect to each other, with respect to the environment. Happy birthday in this 52nd time. I wish you a delicious chocolate cake. I wish your dreams come true. I wish for you and yours a life full of health, peace and love. Despite I'm out of...some depression... I love you and U2, for ever. by Regina O'Numb - Sao Paulo - Brazil. Dear Bono, you never blind to world's tears, you never silent to world's pain, you encourage the world to pray not to feel defeated. You're amazing, cause you see, hear our feelings an sing for us. You connect us all with U2's music. Happy Birthday Bono! Long life for you and family and friends. God Bless you for ever. Regina O'Numb - Sao Paulo - Brazil. Happy Birthday to our favorite frontman! Hope 53 is the best year ever. We ? you! Anna In The Zoo ???? In my castle, you´re, always, the KING! Happy anniversary! I admire you so much. Happy birthday. Happy Birthday!! Wish you a wonderful day! 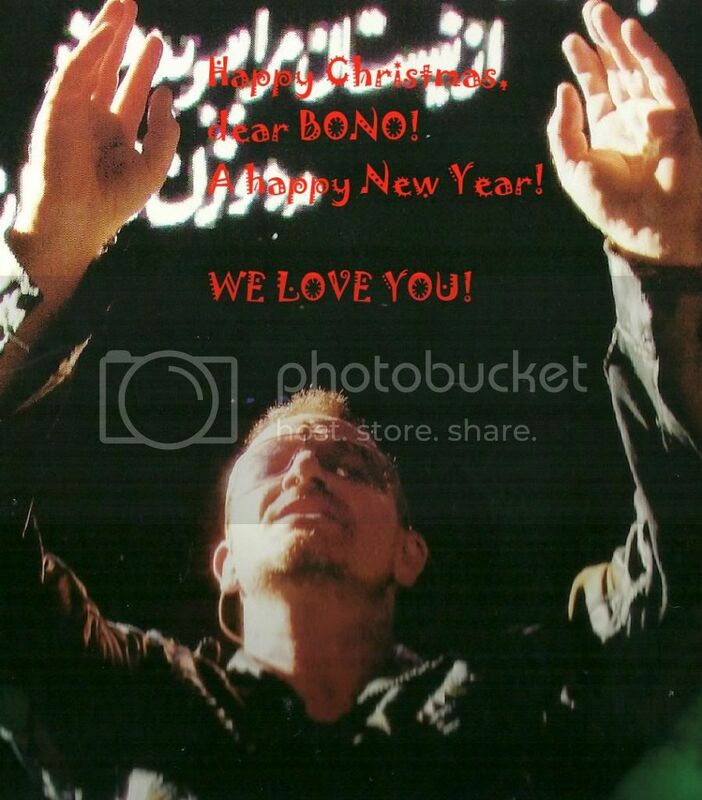 Dear Bono, I wish you a wonderful birthday. May our Lord keep you safe and in good health. Blessings for you and your family all year round. Adam, feel yourself, ever invited to visit the Tupiniquins' land (Brazil). We love, when you´re around. HAPPY CHRISTMAS for you and your "clan", Lord Adam! Health, peace, love, too. God Bless you! I wish your dreams come true. by Regina O'Numb - Sao Paulo - Brazil. Adam, Merry Christmas to you! I wish you a lot of joy, peace and love. I´m happy to see you love my country (Brazil), so I hope to meet you here one day, just like some friends did. They told me you´re very nice and I´m sure you are. You´re always welcome here! Have a great year! Best wishes, Fernanda D´Elboux Bottini from Brazil. Merry Christmas & A Happy New Year in 2013!! Dear Adam, i wish you all the best for the next year! We'll be waiting for you in Italy but you already know that!! :D Love you! Thanks for everything and have a Happy XMas time!! I love music, I love U2. Happy Christmas and A Happy New Year. Never I'll forget february 20, 2006. Happy Christmas; Happy New Year! I hope great party for you and yours, this Christmas time. My fortune is to love U2. Happy Xmas time. Lord Adam, Happy Xmas! Happy New Year. Merry Christmas and a happy and wonderful New Year!! Bono, you don´t need a star to light up your way, cause you´re a star that light up our way, to see, to think and to do anything about the cruel reality of our planet. THANK YOU SO MUCH for this awareness. HAPPY CHRISTMAS for you and yours! God Bless you! I wish your dreams come true. by Regina O'Numb - Sao Paulo - Brazil. Bono, my idol! You´re such an inspiration in my life, I can´t describe how much you´ve influenced me because I´m an U2 fan since childhood and now I´m 30! I love you but no only because your voice and songs, but due to your attitudes. You´re an amazing human being and you show to the world that respect and love and compassion are still on. Your humanitarian work for Africa is great! Of course I´m an U2 fan so sometimes I ´d prefer see you on stage or in the studio making new songs... haha. But I can´t forget who you are and I know how this is important for you and you are helping to change the work, to make it a better place for all of us. So all I can say is thank you!! I do support your campaigns and I hope one day to meet you. Merry Christmas to you and your family! I´m waiting for a new album on next year, right? Best wishes, Fernanda D´Elboux Bottini from Brazil. Feliz Natal Bono! Feliz Ano Novo! I hope see U2 for the first time in my life. God Bless you and yours in this Christmas time. Happy Christmas with your family. Happy New Year! You´re a special son of God! Happy Christmas and a Happy New Year! Merry Christmas and a happy wonderful New Year!!! Larry, Larry, with the talent of the world's best drummer, one of the most beautiful faces of the universe, you also owns a charming smile. HAPPY CHRISTMAS for you and yours, with helth, peace, love. I wish your dreams come true. God Bless you! by Regina O'Numb - Sao Paulo - Brazil. Larry, my gorgeous drummer! Everyone says you´re handsome but I´m sure your beauty is not only outside. I know you´re sensitive, honest and sincere. And you didn´t change because you became famous… you´re the same guy who lives in the north side. And I know you just want a common life for you and your family… going to pubs with your friends or to football games. And it´s great to see you acting. So I love the way you are! 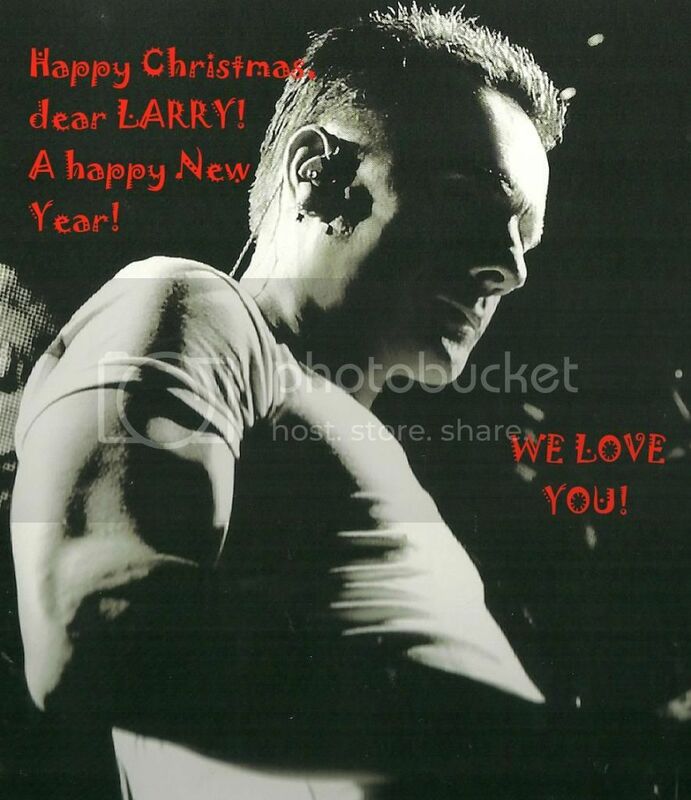 I have to thank you for forming U2 because you´ve influenced my all life since childhood and now I´m 30. Please keep doing this for a long time… haha. I´d love to meet you one day. I´m waiting for a new album next year. Merry Christmas to you! Best wishes, Fernanda D´Elboux Bottini from Brazil. You´re my hero, my favorite member of U2. Feliz Natal e Próspero Ano Novo. Happy Christmas time! A great New Year for you and yours! Happy Christmas and a wonderful New Year!!! 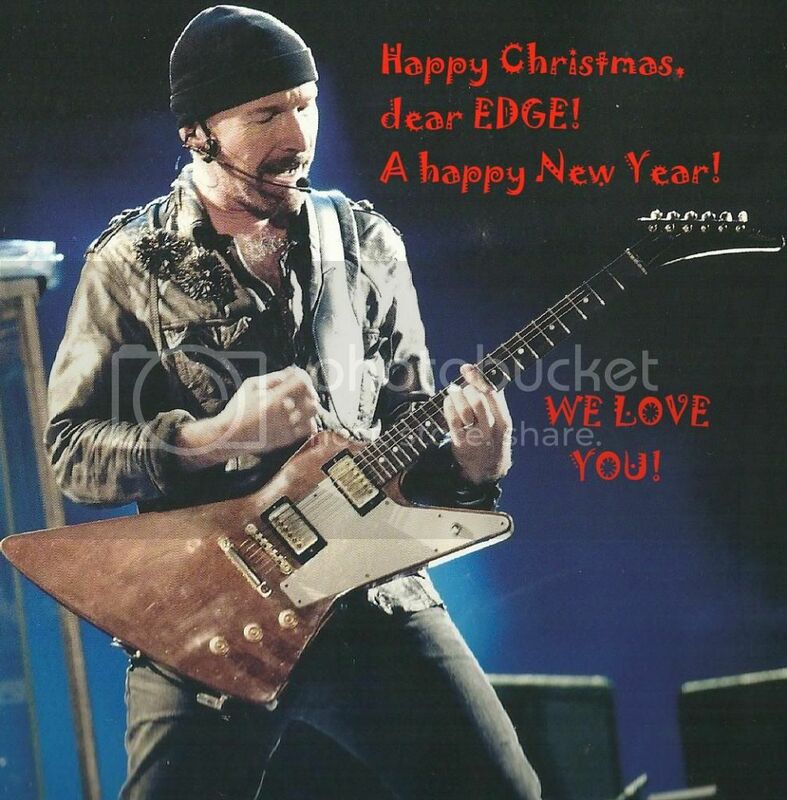 Dear Edge, HAPPY CHRISTMAS! May your way, to be a road so florish, so peaceful, full of love, full of health, full of inspiration; beside your beautiful family. May your guitar, brings for you all the sounds that you desire, those little chords, those wonderful chords. I would like to be a grain of sand to witness your walk. God Bless you! I wish your dreams come true! by Regina O'Numb - Sao Paulo - Brazil. Edge, Merry Christmas to you and your family! I wish a lot of inspiration for next year. I´m sorry but I´m a fan… I really want new songs, haha. And I know you´re a genius. You´re also patient and sweet. When I´m in difficult moments, I think what you´d do because I know you´re a sensitive guy who keeps the faith. Thanks for being like that! Best wishes, Fernanda D´Elboux Bottini from Brazil. You´re so gorgeous... Happy Christmas and Happy New Year! From Japan: Happy Xmas, Happy 2013. You´re the best guitar man. Happy Xmas, Happy New Year. I play guitar cause you. You´re the best: my hero. Happy Christmas, Happy New Year. Of science and the human heart, there is no limit....Happy Christmas and a Happy New Year. The wind brings me a sound, maybe is your sound from a development moment, surely is a genius mark. Happy Christmas and a Happy New Year. Merry Christmas and a wonderful New Year! !